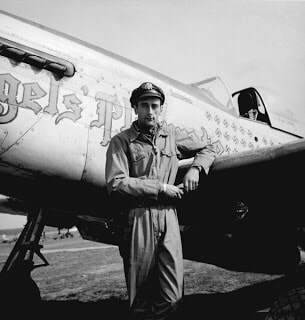 Bruce Carr of the Town of Springport (Union Springs), New York, flew a P-51 Mustang in Europe called "Angel Playmate." 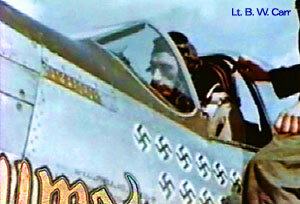 By April 1945 he was ace with fourteen confirmed German kills. Today his airplane is on permanent display at the Paris Air Museum. Bruce was famous in WWII for another reason. He was shot down over Czechoslovakia in 1943 and parachuted safely to the ground and evaded capture. A week later he found a German fighter strip and from the nearby woods watched a German maintenance crew servicing a Focke-Wulf Fw 190 fighter plane. That night he climbed into the cockpit and waited until sunrise. At sunup he started the engine and took off before anyone realized what had happened. He flew at treetop level into allied France and belly landed at an American airbase, his airplane shot full of holes by air base anti aircraft units who did not realize who was as he tried to land. Bruce is recorded in USAF history as the only American to fly into Germany with an American fighter plane and return with a German one. Horace Eugene Carr, of also of Springport, New York, got his fighter pilot wings in 1948, then flew combat missions in Korea and several Air Medals, then flew more combat missions in Vietnam with the 405th Tactical Fighter Wing, was seriously wounded and awarded more medals. In 1982 Horace retired as a Colonel at the Pentagon.